The title of Event Photographer might not sound particularly glamorous or exciting, but in this role I often tap into my multi-media knowledge and resources to help my client tell the most important story ever captured…their story. This visual narrative includes their vision coupled with my unique perspective and keen eye for storytelling. It’s my job to thoroughly document both planned and unplanned moments to make the story count, to meet their goal, whatever that may be. Each event holds different challenges. Some clients may want a series of reportage style photos of the people and interactions, whereas others will want to focus on the overall setting. In brief, here are some of the steps I move through when considering your event. The list is different based on each photographer’s experience. In depth, detailed conversation with the client about their expectation is critical. Some have very clear thoughts on the types of shots they want. Others might prefer a more hands off approach. As an event photographer, there’s nothing worse than delivering the photos to find that they’re just not what the client was looking for. Having these conversations beforehand will clarify the shoot and reduce the chances of that happening. The style required for a brand launch or wedding varies greatly from that required for a gallery opening or cocktail hour. The type of event determines the style in which I shoot and how to best represent the event’s atmosphere. It’s also vital to understand who are the most important people at the event. At a wedding, it’s obvious, but at a corporate event, it might not be so easy. To ensure that I capture VIPs correctly, I arrange for my clients to point out who should be prioritized. Before I start getting too creative, I nail down a good bank of shots that capture the overall event. This usually includes some wide-angle shots to establish the venue, both inside and out, and some detail shots of the more interesting aspects of the event and the key people involved. Once I’ve got those in the bag, I can start thinking about creative angles and vantage points. I always find that I get more confident and creative as an event progresses, as I’m more comfortable with the surroundings and the guests are more comfortable with me. Once an event is over, it’s up to me to convert and post-process responsibly. The majority of people will not want to see vast amounts of creative editing, filters and photo shopping. They’d much prefer a set of clear and crisp shots that are true to life, so I bear that in mind when working in Photoshop and don’t get carried away. Too many photographers forget that they are working for the client. What one sees as a great photo, others may not like. In the end, you have to deliver what the client expects. I’ve already stamped my mark on the shots through the creative decisions made in camera, the exposure, composition and framing, so I don’t get frustrated if a client rejects my favorite shot. There are many methods of file delivery, such as: online galleries, a physical flash drive, or meeting in person to discuss the images. It’s important that I meet the client’s needs and I’ll go that extra mile to confirm their satisfaction. I hope you’ve found this information helpful. 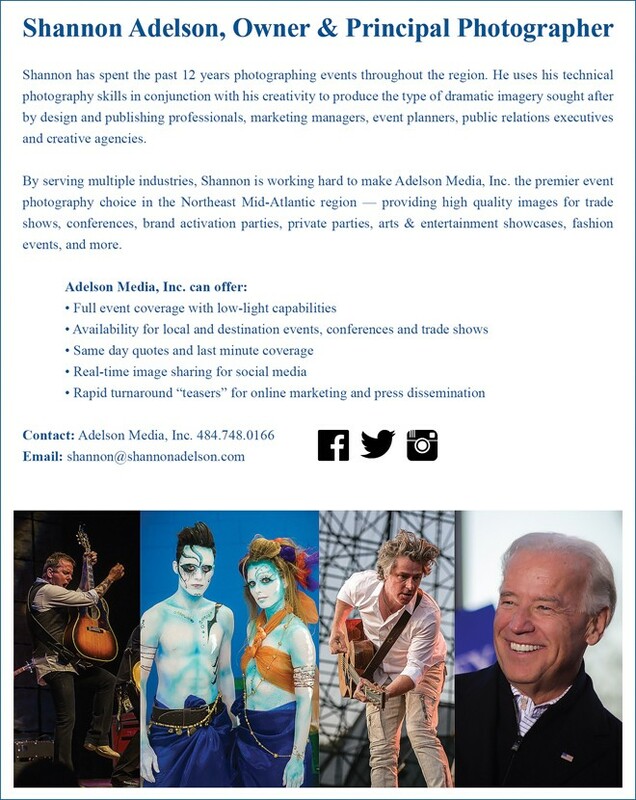 At Adelson Media, Inc. I am committed to building brand loyalty, one satisfied customer at a time. Taking on your event and exceeding your expectations brings real meaning to my work. Thank you for reading my article.